The SG-PCI2S422485IS 2 port PCI RS422 /485 Card with isolation and surge suppression maintains backward compatibility with your PCI applications and drivers to provide a scalable, high-speed serial I/O bus. Protects serial devices from ESD (Electrostatic Discharge) occurrences during operation. 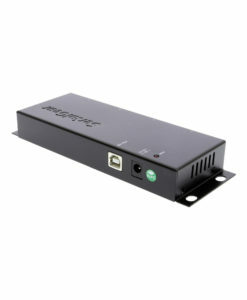 Compatible with new and legacy RS422 /485 devices allowing adaptability between applications. Easy installation following an install wizard. The 2 port PCI RS422 /485 Card w/isolation and surge suppression maintains backward compatibility with your PCI applications and drivers to provide a scalable, high-speed serial I/O bus. Its architecture defines a high-performance, point-to-point serial bus at speeds of 250Mbytes/sec up to 4GBytes/sec and in the future, speeds up to 8GBytes/sec. The SG-PCI2S422485IS is compatible with new and legacy RS422 /485 devices allowing adaptability between applications. The plug-and-play feature makes it easy to install and use with your system and provides expand-ability to quickly adapt to new serial technologies. Your serial network grows as your application requirements do. With the Install Wizard, simply follow the instructions; configuration regarding I/O address, IRQ jumpers, DMA or others when connecting your serial devices has been taken care of. The system will recognize the device and install the drivers automatically for you. The SG-PCI2S422485IS is a great solution for expanding serial applications.